The western edge of the Northwest Coast is the nation’s greatest example of temperate rainforest. High rainfall—more than a dozen feet on average—and mild temperatures have made these coniferous forests some of the planet’s most productive. Trees grow big here. In the protected area of Olympic National Park, Sitka spruce and western hemlocks can top 300 feet in height and more than 20 feet in girth. 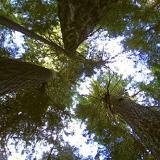 Western red cedar and Douglas-fir also join the closed canopy. The rainforest offers ideal habitat for a variety of epiphytic ferns, mosses, and lichens. In the alpine heights of the Olympic Mountains, wildflowers grow abundantly through their short season. Meadows of Sitka valerian and lupine contrast with scree slopes dotted with cushion plants. These mountains are the only place in the world where Olympic Mountain synthyris, Piper's bellflower, and Flett's violet grow wild. Marshes, fens, ponds, and seasonal wet meadows, along with riparian and herbaceous wetlands, each host their own suite of plants and animals. Trees like black cottonwood, big leaf maple, red alder, and Oregon ash grow in moist ground, accompanied by thickets of willow and Pacific ninebark.